Baton Rouge, LA – December 8, 2016 – Lamar Advertising Company (Nasdaq: LAMR), a leading owner and operator of outdoor advertising and logo sign displays, announces that its board of directors has declared a quarterly cash dividend of $0.76 per share payable on December 30, 2016 to stockholders of record of Lamar’s Class A common stock and Class B common stock on December 19, 2016. Subject to the approval of its board of directors, Lamar expects to make regular quarterly distributions to stockholders in 2017 in an aggregate annual amount of $3.32 per share, a 10% increase over the aggregate distributions paid or to be paid in 2016 of $3.02. This press release contains “forward-looking statements” concerning Lamar Advertising Company’s goals, beliefs, expectations, strategies, objectives, plans, future operating results and underlying assumptions and other statements that are not necessarily based on historical facts. These statements include, but are not limited to, statements regarding anticipated 2017 distributions. Actual results may differ materially from those indicated in our forward-looking statements as a result of various factors, including those factors set forth in Item 1A of our Annual Report on Form 10-K for the year ended December 31, 2015, as supplemented by any risk factors contained in our Quarterly Reports on Form 10-Q. We undertake no obligation to update the information contained in this press release to reflect subsequently occurring events or circumstances. The Face of Giving campaign allows you to turn your Selfie into a Helpie. Participants submit a selfie for a small donation. Each selfie will then appear on digital billboards in countries around the globe. 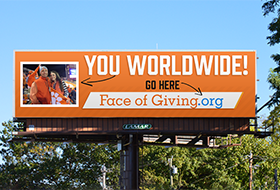 Participants literally become the “face of giving” as their donation helps meet a need. 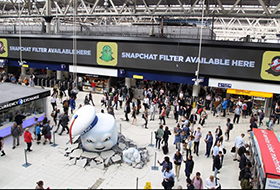 Outdoor advertising is not just a vehicle for raising awareness, it can also drive purchase consideration and intent, and be used to communicate brand positioning.